The peer reviewed paper recently published by John Wyndham at the Journal of 9/11 Studies supports the findings of our papers. His paper shows how application of the scientific method to the evidence can be used as a tool to clarify our understanding of this event. Attached is an updated version of the spreadsheet which allows calculation of the g-force the plane would experience on a straight approach. ...I am sure about the overall objective. It is true that a small minority claim that a plane did not impact the Pentagon, or even the WTC. Most in the 9/11 truth movement argue that a flying vehicle hit the Pentagon, and I would argue that there is no definitive way to PROVE it was a normal passenger plane, or a military aircraft gussied up to look like a passenger plane. Looking at this event in context, the LEAST likely scenario is that proposed by the government: that incompetent pilots executed a daredevil trajectory that was totally unnecessary, that government agents were on hand almost immediately to seize pieces of wreckage and videos of the event (and thereafter REFUSE to release them), that the damage from the impact was totally inconsistent with a large aircraft, that the penetration thru multiple walls that left a circular hole was accomplished by landing gear, that the location struck was obviously chosen with care, etc. etc. Those who believe the 3 skyscrapers in the WTC were destroyed by controlled demolition, rather than Jihadists flying airplaines, cannot reasonably argue that on the same day the plotters of 9/11 would allow any uncontrolled scenario to create shock and awe via a parallel attack in DC. The idea that the government has video footage that proves there is a benign explanation for the damage to the Pentagon, and is witholding it to splinter the 9/11 truth movement, is really far fetched. instantkarma on Sun, 01/08/2012 - 4:50pm. grumpy brian on Sun, 01/08/2012 - 5:17pm. *EITHER* jihadists *OR* the United States Government? SnowCrash on Sun, 01/08/2012 - 6:29pm. There is evidence of two separate events at the Pentagon, first at 9-31 (an explosion of sorts) and then at 9-37 (a large airplane). The false dilemma theory should be applied in this case as well... you don't have to choose between *either* a plane *or* a missile/bomb. The fact that there is so much bickering and brouhaha re. this aspect of 9/11, encompassing multiple explanations/theories, (combined with the natural tendency to choose between one *or* the other), suggest that what happened at the Pentagon was more a complex scenario than can be accurately represented by the simplistic "either/or" paradigm. bloggulator on Mon, 01/09/2012 - 1:19pm. Your description of my article is incorrect, and your application of the false dilemma fallacy (which isn't theoretical, but a known and documented logical error) is inappropriate. There is no evidence whatsoever of two separate events at the Pentagon, as proposed by Barbara Honegger. This has been pointed out many times, apparently to no avail. Nobody witnessed any explosion at the Pentagon prior to impact of AA 77. I do not offer a "choice" which could be described as a false dilemma between either a plane impact or a missile attack, because I do not accept a missile attack as a variable at all, due to the complete absence of evidence for a missile, in both the witness and physical evidence. If I do not offer a choice, I cannot offer a false choice, which means I could not have committed a false dilemma fallacy with respect to the Pentagon impact discussion. When a discussion is framed around two binary variables, (Al Qaeda, US Government), there are four possible outcomes. There exists too much credible evidence confirming the existence of hijackers, making their involvement not only logically possible, but historiographically defensible. None of the hijackers' grieving family members have been reunited with them. The hijackers are dead, and they died on 9/11. In my opinion, the 9/11 Truth Movement shouldn't be cajoled into an either/or position. Think about it. Don't let anybody fallaciously limit your choices. There is no credible evidence whatsoever for a missile, so a missile attack is not a variable. One can reason in the logical domain for purposes of clarification, where one would allow for variables introduced without evidentiary justification, as I did with when reasoning from within CIT's universe of irrationality: from their perspective they cannot exclude NoC + impact via a false dilemma. From my perspective, however, I don't accept the quixotic physical evidence fakery scenario proposed by them at all, so I offer only one option: impact via the official south path. True dilemmas exist, too: for example a bit in computer memory must either be 0 or 1: there is no alternative. A woman is either pregnant or she's not: there is no in between. In the court room, someone is either guilty on a certain count or not: there is no half-guilty or 30% guilty. In tennis, the ball is either in or out: it can't be a little bit of both. I emphasized the word fallaciously in the last sentence of my conclusion, because situations where a logically sound limitation of choices is presented exist too, and are not fallacious. The purpose of my article is to demonstrate the fallaciousness of claiming responsibility for 9/11 must be attributed to either the United States Government or Al Qaeda, while credible evidence exists for both, which means we have two variables which are logically, epistemologically and historiographically valid and are not mutually exclusive. I would appreciate it if you would not misrepresent my article as (indirectly) supporting "missile at the Pentagon"-claims, because such twisted interpretations are utterly and totally false. SnowCrash on Mon, 01/09/2012 - 4:45pm. It is a characteristic of those who dispute the plane impact theory at the Pentagon that they typically display serious knowledge gaps. It has been said, I thought very cleverly, that one does not need to be a physicist to count the number of buildings brought down by two planes at the WTC. You only need to be able to count to three. Similarly one does not need to be an architect to count the number of walls the plane had to penetrate to arrive at the C-ring. The number is one. See John Wyndham's paper. This plane, travelling at 560 miles per hour, could not do other than burst through the outer wall of the Pentagon. The aluminium body of the plane is too weak to transmit much impact deceleration force back through the plane's structure, so the front of it must crumple till the wall gives way. See the F4 Phantom experiment for proof the front will crumple while the rest of the body continues on at close to original speed. Then the rest of the body continues on through the hole at close to its original speed. Once through the hole there is nothing to impede its progress other than the support columns, which will shred the plane into thousands of fragments. This shredding will slow the fragments down but there was apparently still enough momentum at the C-ring to push through the brick wall. Please note that the paper makes no claim about whether the plane was standard or how it was flown. It merely claims the plane flew virtually straight and hit the Pentagon. It concludes this because the curved path round the service station was shown to be impossible and the witness testimony to a straight path and impact is very much greater than that for the north path. And of course there was no witness to overfly. Frank Legge on Mon, 01/09/2012 - 10:19am. Does Paper Utilize Incorrect Calculation Data Points? It seems this paper is misleading for the following reasons. - an AA 77 flight path alleged to be parallel with the south edge of the Navy Annex. With all due respect, because the data points are false, the calculations are meaningless and the conclusion (that AA 77 needed to perform an extreme banking maneuver to be observed "north of Citgo" by 3 Citgo witnesses) is invalid. Aidan Monaghan on Wed, 01/11/2012 - 8:18am. Aidan, in all the various images we have used to try bank angle and g-force calculations we have assumed that the radar data from 4 separate radar facilities was correct. The last radar position, just south of the Sheraton hotel, must be pretty accurate as it comes from a very close facility, Reagan National Airport. If you look at Fig. 1 of the NOC refutation paper you will see that the yellow line passes nicely through the radar data. We find in every case that the bank angle required is outside the possible range, given the very many eyewitness reports to little or no bank. If you choose to ignore the radar data, and just draw a more northerly path that can be fitted to the witness reports, I think you will find that again the bank angle will be outside the realistic range. You could for instance try running the plane up Columbia Pike. That would fit with Deb Anlauf, Ed Paik, Isobel James and several others, but conflict with the many more who said the plane was coming up Hwy 395. Then you would have to take into account that Morin stated the plane was flying parallel with the Annex. You would also have to take into account the very credible witnesses Stafford and Prather who demonstrated with a model plane that the plane they were watching was flying wings level as it passed the Annex. Then if you totally ignore the testimony of Albert Hemphil you could start turning the plane left to go round Citgo, then right to get back on course for the impact point on the Pentagon. I will be very interested to learn the bank angle you find necessary for that. AM: "It seems this paper is misleading for the following reasons. ... Morin is ... placed by the paper between the southern edge of the Navy Annex and Columbia Pike, when in fact he was between the third and fourth wings of the Navy Annex (from right to left) and unable to observe:"
It appears he was not between the wings at all as the plane went over. He was "10 steps out". His description of the plane descending behind a row of trees is very clear. He could not have seen that if the plane had turned left. According to Google Earth, if he had been standing on the north edge of Columbia Pike he could have seen the entire path of the plane to the impact point. You will see that, if you look again at the image you cropped, Fig. 1of the NOC refutation paper. Frank Legge on Wed, 01/11/2012 - 9:53am. Yet, you arbitrarily rely on the Morrin account that fits your hypothesis. The responsible position would be to admit the uncertainty of certain evidence. You also don't account for the Paik AA 77 path description. With Paik claiming the fuselage was directly over his shop, if AA 77 is even where your preferred Morrin account places it, the plane would then have to turn left (not right as many observed) in order to impact light posts and hit where it did. Tracing a straight path from Paik's observation to the impact point, AA 77 flies over the southern edge of the Annex and misses the light posts. And the latest papers seem to offer no adequate explanation for why the corroborating accounts of LaGasse, Brooks and Turcious are wrong about a "north of Citgo" path. With very debatable data points, yourself and others have proceeded to make very definitive outcome claims. Aidan Monaghan on Wed, 01/11/2012 - 6:09pm. It's Morin, Lagasse and Turcios, not "Morrin", "LaGasse" and "Turcious". Terry Morin is a clear SoC witness, so to avoid having to face this reality, that is, the reality that the claim Morin is a NoC witness is a lie, CIT defenders usually switch to claiming his account doesn't exactly match the Official Flight Path. Well, no, and it doesn't have to. In fact, none of the witnesses have to match the official flight path exactly, that's why they're witnesses and not computers. Turcios probably embellished his account, as the Citgo footage didn't show him running up the mound but back into the gas station. Fact, is, witnesses are expected to be extremely inaccurate with these sorts of things (tracking a fast moving flying object in relation to the ground), so CIT's biased selection, composed by cherry picking, proves nothing. When interviewed on the scene, at the wrong pump, Lagasse didn't notice until it was finally reluctantly pointed out to him by Ranke. Witness confidence is no metric for witness accuracy. SnowCrash on Wed, 01/11/2012 - 7:01pm. You will hear Morin say, at 7:15, that he "ran to the outside...that's when I watched the airplane...into a position where I could see it", thus supporting his previous "10 steps out". Then he and Ranke discuss a line of trees between his position and the Pentagon, and Morin continues "as he starts to descend...he basically starts to disappear...so the bottom of the airplane and the engines disappear, the bottom of the fuselage, the wings, so what I've got is the tail stabilizer, the arse end of the airplane is all you can see." If it turned left it would go out of sight, left wing first, behind the Annex, but Morin describes it as going out of sight, bottom first, contradicting the notion of a steep bank. Nothing could be clearer that the plane is flying straight and descending. Ranke and Balsamo then make a big issue about the fact that he couldn't have seen the impact because the trees were in the way. These are the same trees that Morin was saying the plane descended behind. At 17:42 Balsamo says that Morin could not have seen the impact point but would have been able to see the top floor of the building. It is clear, therefore, that if the plane had flown over the building Morin would have seen it do so. He did not: he reported its gradual descent till out of sight, therefore inevitably impacting the Pentagon. Even if we allow that the plane had gone completely out of sight for a second before impact the conclusion is still the same. He knew precisely when impact occurred because he saw the smoke cloud. The fact that CIT use Morin as a witness to NOC and overfly is an absurdity. It is scurrilous misrepresentation. Similarly Albert Hemphill gives a clear discription of the plane flying straight from a point not far from the VDOT antenna tower, over the bridge where the light poles started, straight into the Pentagon. No mention of a steep bank. He was very precise and very definite. The only way you can dispute Hemphill is to say that he was lying in every interview and written statement he gave. Now let us look at Ed Paik in detail. First CIT hides the fact that he was inside his shop looking out through the window when he saw the plane. This is scurrilous deception by omission of a pertinent fact. It is true that Ed Paik drew a path angling to the left across the roof of the Annex, but I put it to you that assessing the angle accurately would have been a tall order for a man who threw his head down to look upward at the plane for a fraction of a second through a window. You have to also take into account the fact that Ed and his brother speculated that the plane may have hit the VDOT antenna tower. The got this idea from noticing that an antenna on the tower was bent and seeing repair work being done there the next day. Clearly this shows that they had reason to suspect the angle that Ed drew on Craig's image was incorrect. CIT do not mention this aspect of the Paik testimony. This is more scurrilous deception by omission. It is also clear that, if Ed saw the plane through the window, he will not know whether it is over the edge of his workshop or further south unless he also knows how high it was. Simple geometry will elucidate that fact. There is considerable evidence from various witnesses that they assumed the plane was closer than it was. Ed's testimony is quite in accord with passage of the plane close to the VDOT tower. AM: "And the latest papers seem to offer no adequate explanation for why the corroborating accounts of LaGasse, Brooks and Turcious are wrong about a "north of Citgo" path." What an astonishing remark! With overwhelming testimony that the plane was not at a remarkable bank angle, these witnesses have to be wrong about the path of the plane. They were not wrong about one thing however, they all said the plane hit the Pentagon. Some say that Turcios could not have seen the impact but he could certainly see the roof of the Pentagon and could logically deduce impact from the fact that he did not see the plane fly over. When asked, he said he did not see the plane fly over. Brooks, who was across the road from the service station, could certainly see the impact area and describes the impact. Since you mention the word "corroboration" in relation to these 3 witnesses, how about considering the 100 witnesses who corroborate impact? I am still looking forward eagerly for your bank angle calculations based on a reasonable flight path. Frank Legge on Wed, 01/11/2012 - 11:33pm. tell me again how we know for sure what brand of RA AA 77 had? Who is the source for that information and how do we verify it? How do we find out if this is the case specifically for AA 77 rather than a 'guess' wrt Boeing's 757 fleet? I want to be sure, really sure. SnowCrash on Sun, 01/08/2012 - 6:34pm. If by RA you mean radio altimeter, does the brand matter? Pressure altimeters need calibration to correct for errors under various flight conditions but a RA is not affected by speed so does not need calibration. If it is correct while stationary, as proved, it will be correct at any conceivable speed. It is true that the RA can have an error up to 2 or 3%, whch would vary with brand, but close to the ground this produces a very small error. Some argue that the RA does have a speed limit, but this is about vertical speed. AA77 was not travelling anywhere near the vertical speed limit. Frank Legge on Mon, 01/09/2012 - 10:05am. Note: This is for information only. The parts actually installed must be determined by a physical inspection. Installation not guaranteed. The LOPA included might not exactly reflect the configuration of all the aircraft featured in this document. And so I wonder if this information could be obtained via FOIA request, even though it may be considered inconsequential. SnowCrash on Mon, 01/09/2012 - 7:09pm. If a large jet plane, how do you overcome the airlift? Expert pilots know how to force the aircraft down at 140 MPH when landing using flaps and so on, but how do you overcome the huge amount of airlift that the wings create at 500 MPH to keep the plane low to the ground? Can amateurs do that? dalethorn on Mon, 01/09/2012 - 6:11pm. SnowCrash on Mon, 01/09/2012 - 6:51pm. Karl Rader, in his article "Ground Effect: It’s not a Cushion, it’s an Effect of Lift Creation", includes diagrams apparently copied from the FAA’s Pilot’s Encyclopedia of Aeronautical Knowledge. The graph of lift coefficient versus velocity shows that the extra lift obtained due to ground effect, close to the ground, diminishes as angle of attack is reduced and disappears altogether at zero angle of attack. Previous versions of the paper omitted this information. It is the one failing of the currently published version of the paper that I am aware of. It doesn't seem important enough to go to the trouble of updating the paper. Lift depends on the “angle of attack”, which is the angle between the effective plane of the wing and the direction of travel. At high speeds the angle of attack required to provide lift is very small. As ground effect also depends on the angle of attack it follows that if the ground is approached at high speed, there will be very little ground effect. Any ground effect remaining could be overcome by using nose-down trim or pushing forward on the control column, or both. Frank Legge on Tue, 01/10/2012 - 1:22am. "By their fruits ye shall know them" What's the end result of all this fighting over what hit the Pentagon? It divides us & it becomes 'The' question about 911 and the Pentagon so that all of the very compelling undebunkable evidence NEVER gets mentioned. Could this be by design? Rather than choosing one side or the other (Legge/Chandler Vs CIT...a false choice) we should simply choose not to play the game. It takes two to Tango. For all we know they are working together Good cop/Bad Cop to divide us and draw attention away from the better evidence that never gets mentioned because of the 'What hit the Pentagon' question that the same people keep raising again & again. I would suggest that we admit that we do not know what hit the Pentagon. When the subject is brought up we should point out that all of the video tapes were almost immediately seized & almost all have not been released, That the site was completely controlled by agencies of the US Government,That the Pentagon was struck at the farthest point from the military leadership (NMCC,SecDef),That the section struck was mostly empty (about 1/6th capacity),specially prepared & re-enforced to make it bomb blast resistant (the catchers mitt),that it was the only one with full fire sprinkler coverage,That it was struck perfectly to minimize damage/Penetration (would have penetrated all 5 rings but for the diagonal angle) etc,etc. These things are compelling and they do NOT predictably end up as an unprovable debate like the question 'what hit the Pentagon' Always does. waitew on Tue, 01/10/2012 - 1:43am. Bravo!! There is little else to say. bloggulator on Tue, 01/10/2012 - 2:09am. There is a lot more to hear. Tell me what you think about this article when you are done reading it. grumpy brian on Tue, 01/10/2012 - 2:59am. Is it really our job to ,"promote to the public" any alternative theory? or is our job to demonstrate that the official story is false,ask questions & demand answers? They are not the same thing. In fact I would go so far as to say that had we (the movement) stuck to asking questions & pointing out the obviously false & contradictory/changing nature of the official story along with a quick primer on history,the Cold war and who really benefited from 911,we would have won a long time ago. Instead we stopped asking questions and told people what happened (Controlled demolition/what hit the Pentagon).These two alternate theories,in the mind of the public, then became the ONLY questions about what really happened on 911.Both alternative theories have one thing in common:both are ALWAYS unprovable & both ALWAYS end up as expert versus expert debates that prove nothing and go nowhere and send the message that ONLY experts are qualified to question the official story of 911. If we stuck to asking questions,we'd be better off. The more basic and fundamental the question the better: Without 911 would America still need a huge Cold War sized military? Why? Who would 'the enemy' be? What would the defense budget be like? CIA budget? FBI budget? What did 911 do for the budgets of the agencies that we are told 'innocently' failed us on 911? What excuse would America have had to invade the Middle East without 911. Would the American people being willing to fight a war if they were told it was for control of another nation's resources (oil)? Etc. These are the types of questions we should be asking before we ever get to any discussion of any alternative theory. This is so obvious to me that I can not believe it is anything but deliberate that these types of questions have been buried & ignored by the organized truth Movement. waitew on Wed, 01/11/2012 - 1:42am. Let CIT have their analysis and let Legge/Chandler have theirs. I liken it to two sides of a perpetual court battle, still in progress. We are the jury and we are not sent to deliberate yet. As jury member, (in some states) I can send questions to the judge that I feel are not being asked by the attorneys. Keep sending questions. Keep the process alive. Don't let one side declare an end to the presentations. The pressure should be upon the agencies who took control of the site (FBI). They had no authority to do so. The NTSB should have been the lead agency, but they caved and let FBI oversee everything. 1. Would the NTSB have the authority to confiscate 80 some video camera tapes? 2. Would the NTSB be able to hide behind "national security" and not release photos and serial numbers for parts? 3. Would the NTSB have ordered a clean out of the damaged area and beginning of reconstruction? 4. Would the NTSB be given a pass for re-assembling the recovered parts as in the TWA 800 investigation? Nobody trusts a non-transparent government. I appeal to the independent arbiters in this case to give the investigation teams wide subpoena powers and remove the qualified or absolute immunities assumed by the agencies. kawika on Tue, 01/10/2012 - 8:16pm. 5. Is the curved path from the last known position of the plane round the Citgo service station to the point of impact physically possible? Frank Legge on Tue, 01/10/2012 - 8:43pm. why in this and this only case NTSB didn't ask and check for serial numbers parity? why and on which basis the 9/11 WhiteWashCommission refused to take in account the informations of the related ACARS communications (showing UA93 and UA175 still flying - and well far away - after the alleged impact) ? bambooboy on Wed, 01/11/2012 - 12:36am. What impact? I thought it flew over. waitew on Tue, 01/10/2012 - 9:45pm. Asked before, elsewhere. Waiting Patiently. I asked a few pointed questions about this NOC/SOC flight path dilemma. Here is the direct link for those qualified to please answer. Here are the animations put forth by the investigating agencies. kawika on Wed, 01/11/2012 - 12:04am. nothing adds up simply because Truth cant't rely in the hands of staged forged "truths". a 757 flying about 500 Mph hit some poles.... how far away these poles should fall and how far they felt? we do have info enough thanks to UAL ACARS communications to show the world what they told us is pure fakery! we do have info enough thanks to WTC 7 (oh my pretty lovely 57 column!!! ) to show the world what they told us is pure fakery! what is missing us is mass delivering media (on daily basis). there is no bunch of caveman in the world that can plane-swap a scheduled official flight. two neither!!! Only "someone else" can do that. bambooboy on Wed, 01/11/2012 - 12:50am. The only fakery I see is your typing and research abilities. Zero blog entries huh, what have you been doing all this time? grumpy brian on Wed, 01/11/2012 - 1:19am. "my fakery in typing " as You so politely say, depends on the fact that english is not my language. bambooboy on Wed, 01/11/2012 - 6:01am. My patience has grown short. I'll take a breath. grumpy brian on Wed, 01/11/2012 - 6:13am. we're both on the same side of the story. bambooboy on Wed, 01/11/2012 - 7:17am. I don't know what kind of childish game is going on here, but anyone who votes down a comment containing FACT should have the decency to do it openly. How do you vote down two professionally produced animations, authorized for public disclosure, showing the same flight, but with significant differences? These animations would be admissible as evidence in a court of law. If I were on the jury and saw them I'd be asking some serious questions about them and wanting to know who screwed up! What is it about this comment that you don't like? kawika on Thu, 01/12/2012 - 12:25pm. I can only speak for myself and say that the issue has been discussed with intensity and frequency over the years, and although I have a general idea of why the animations looked the way they did, from Adam Larson and John Farmer among others, I am not content with the level of detail and accuracy I could provide you on this topic at this time. The combined issues at hand for the animations you mention involve magnetic declination, ground track grid rotation on the animation, faulty radar data (actually faulty interpretation of radar targets which weren't actually targets, but taken as such nonetheless; AA 77, by that time, was too low), promotion of a working copy as an official copy, etc. etc. Quite involved. So, I'm not responding because I don't want to give you an incomplete or insufficient explanation by my own standards. I'll give you this though: we better make sure those witnesses CIT interviewed did not sneak on the internet beforehand or look up official reports to "brush up" on their flight path memories, otherwise we have an escalating witness contamination situation on our hands. (They could be either contaminated by inaccurate data tending towards the north or accurate data matching the OFP, of course) Yes, I do think it's entirely possible some of them googled or talked to each other before being interviewed, which would introduce data-to-witness and witness-to-witness cross-pollination. In a bad way. SnowCrash on Thu, 01/12/2012 - 2:14pm. The first animation you provide is of course nonsense. It shows a steep right bank near the end. Nobody saw this. Why it has been presented I have no idea. The second animation is the last part of the well known NTSB animation. I find this quite useful. Of course it is coming in at the wrong angle, and it finishes too high due to the fact that the last few seconds have been omitted. The NTSB says that this animation was not used for any official purpose, so it cannot be taken, as presented, to represent the official story. Why therefore do I find it useful? First let us look at the error in the arrival angle. If this was a true error of navigation of the plane's path, the animation would show the plane taking off in a wildly wrong location. It does not. The plane takes of from Dulles. So how is the error explained? The only rational explanation is that the software that converted the FDR data to the animation contained a flaw which added a minute error to the heading at every recalculation. A rounding error could have done this. Rounding errors are not uncommon in database programs. What the animation enables us to see is the behaviour of the plane in flight. Another good animation is that provided by Calum Douglas, which he has speeded up about 10 fold, thus making it easy to assess the whole flight in a reasonable time. The animation you link to is better for assessing the behaviour in the critical last stages, as it is done in real time. We see that the plane never experiences a severe bank or g-force during the whole spiral descent, as the FDR shows. We do see that the control of the plane is rather erratic. Regarding the missing few seconds of data at the end, I used to think that the NTSB had done this to both the animation and the CSV data file from the FDR in order to confuse us. I now think it more likely that they did not know that there was a flaw in their ROSE software that prevented it from decoding the last four seconds. Now that they have been shown that an error exists they are not willing to concede that their work is flawed so they remain silent to protect their reputation. 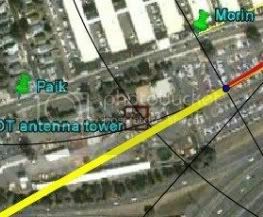 There is no doubt in my mind that, had the NTSB corrected the heading conversion error in their software, they would have shown the plane arriving in the vicinity of the Pentagon at the correct angle, the straight south path, as shown by radar and the FDR file and the vast majority of witnesses. There is no doubt in my mind that if the NTSB were to now also add in the last 4 seconds of data, the plane would be shown flying through the light poles and hitting the Pentagon in the well known position, as stated by the vast majority of eyewitnesses. You also comment on the plane boring through the E ring, the D ring and the C ring. Does this mean that you believe there were walls to break through between the outer wall and the C ring wall? There were not; just support pillars. Also of interest in the animation is the throttle setting. We see that it is at about 30% power during the spiral descent, which is a good setting, keeping the plane flying at a suitable safe, easily controlled speed. Not until about half a minute from impact do we see the throttles pushed forward. This is what we also see in the FDR file and the plane accelerates gradually during this period. The heading displayed on the right side of the animation is finally 70 degrees. This looks about right, after allowing for declination, as the path of the plane was about 60 degrees. It is clear from that, that this animation was based on the FDR file data. Of course to ensure the plane hit the Pentagon the animation would have to switch from pressure height to radio height once the plane was low enough to record radio height. Frank Legge on Thu, 01/12/2012 - 11:46pm. Is there any link to the math involved, in which all the relevant parameters are factored in (total mass of plane with assumed fuel and passenger load, air resistance at ground level, atmospheric pressure on the day at the AMSL altitude of the Pentagon, the amount of throttle applied, angle of descent (if any during final approach), wind direction and speed, initial velocity when plane starts final approach, initial velocity when plane's engines are throttled up for final approach, and the distance between that point and point of impact.. and more). The plane allegedly hit at over 550 mph. Would there have been enough distance involved for this plane to have accelerated from its velocity as it came out of the dive, (or when they throttles were applied during final approach) to have achieved this remarkable speed at the point of impact? Has anyone done the relevant calculations, with a favorable peer review? If so... where can this information be found? bloggulator on Fri, 01/13/2012 - 2:50am. bloggulator, it sounds as though you have not read the peer reviewed NOC refutation paper by Warren Stutt and myself. I will be happy to give further details after you have been through it and made a list of remaining questions. Frank Legge on Fri, 01/13/2012 - 4:20am. Looking at the aerial photographs with the trajectory marked as a line on the roof,that seems like an incredible claim to make. If however,what appears to be the the top of the vertical walls of D ring are actually just a beam supported by columns,then I'm prepared to make a prediction. I predict that walls were originally there & they they were removed as part of the renovation. waitew on Fri, 01/13/2012 - 2:22pm. Am I missing something here? Exterior walls have windows. I count six walls, two for each ring, E,D,C. How many reinforced concrete columns did that debris have to bypass to make it to the punchout on A&E drive? But we are off the subject of animations. kawika on Fri, 01/13/2012 - 7:31pm. Count the windows (in the picture on your link) in the C ring with the exit hole, and notice the space under those windows. Then count the windows in the other rings, you will notice a difference of about 2 floors. The debris did NOT travel through 6 walls. Including the impact, only 2 walls were pentetrated. grumpy brian on Fri, 01/13/2012 - 7:43pm. "Speculate the walls were removed during the renovation"?? This has been explained how many times now?? I remember posting the picture above on 911blogger some three or four times. Since it's from the PBPR, people who claim to see it for the first time have evidently never read the report! The "walls were removed during the renovation"?? Seriously, what kind of world of fantasy do Pentagon no planers live in? You can't just "assert" whatever you fantasize about the Pentagon as fact just to compensate for your errors, fellas! Astonishing this has to be explained to this day. Still. I will make a prediction too: I predict we will never get an apology from those who continue to make false claims about the Pentagon and continue to be corrected. I predict that after a claim about the Pentagon is exposed and confirmed to be totally false, some timid protestations will ensue after which the discussion goes silent, and six months from now the claim will be dusted off, polished up and then remorselessly regurgitated. This is why the concept of accountability needs to be introduced to 9/11 research. Let's tabulate the false claims, fallacies, errors, exaggerations and fabrications made by each participant and repeatedly demand an explanation for a track record of deception. Spreading falsehoods must come at a cost, when the government does it, as well as when 9/11 "researchers" do it. The amount of mis- and disinformation circulated about 9/11 by debunkers as well as truthers is breathtaking. It doesn't matter who does it, but it has to be called out. Not even CIT is this clueless about the Pentagon. You think there are six walls, but there were two, and when you're called out on your error? You know what? Just gyrate and make up your facts and claim they were "removed" during the renovation. How is this remotely acceptable, ten years after 9/11? Are we going to get an apology? SnowCrash on Fri, 01/13/2012 - 8:38pm. Actually,you've put words in my mouth. I never ever stated as fact anything about the walls being removed. Do you have a problem with the English language? I was speculating which is why I said,"I predict". I will not apologize for speculating. I didn't realize speculation wasn't allowed here even when it's obvious from the context it is such. When do I get an apology for the false accusation that I asserted speculation as fact. waitew on Fri, 01/13/2012 - 10:32pm. 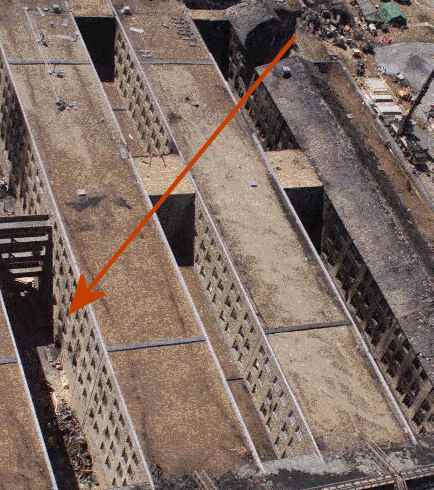 I still find it bloody amazing that debris could pass through this forest of concrete columns, interior walls and still manage to punch out 310 feet away from initially impacting a hardened wall ON AN ANGLE. kawika on Fri, 01/13/2012 - 10:07pm. ...is that these simple facts escape us for this long. grumpy brian on Fri, 01/13/2012 - 11:27pm. If one looks at the prevalence and proliferation of ideas, there may be an initial low, followed by a peak, followed by a final low. We won't ever achieve "zero" no planers, no plane crashers or NoCpacters. That's a statistical reality we'll have to face. In fact, it might be a fool's errand to try to convince people who still don't get it, ten years after the fact, in the face of so much evidence, that a plane crashed into a building in Arlington that day. They are hardwired not to get it, and statistically preordained to remain. Sadly, the belated realization by some that a plane indeed crashed into the Pentagon may have nudged them away from 9/11 Truth entirely. If there is organized disinformation behind this in any way, shape or form (I can't prove it, and I'm not certain there is) then it has certainly been successful. SnowCrash on Sat, 01/21/2012 - 11:02am. We won't ever achieve "zero" no planers, no plane crashers or NoCpacters. That's a statistical reality we'll have to face. In fact, it might be a fool's errand to try to convince people who still don't get it, ten years after the fact, in the face of so much evidence, that a plane crashed into a building in Arlington that day. Perhaps, though we could say that about any 9/11 research 10 years after the fact. The good thing is, I am not ready to give up on any of it yet and I don't think you are either....at least, I really hope not. Fortunately I don't think Frank is ready to quit either. They are hardwired not to get it, and statistically preordained to remain. Sadly, the belated realization by some that a plane indeed crashed into the Pentagon may have nudged them away from 9/11 Truth entirely. Indeed, it is easy for people to embed themselves in their beliefs. However there is hope, a few of us are good examples of reconciling the Pentagon information later than should have been - and still we are sticking it out, myself included. If there is organized disinformation behind this in any way, shape or form (I can't prove it, and I'm not certain there is) then it has certainly been successful. Exotic theories are shiny, and people like shiny. Researching the information out there is tough and overwhelming at times, it is not attractive to too many people unfortunately. I have no idea how to change that other than to continue to plead with people to; look harder and push further; improve your abilities; challenge yourelf; follow the facts, not a leader. grumpy brian on Sat, 01/21/2012 - 3:07pm. I am a bit more optimistic about changing perceptions. I don't think it is surprising that many activists are still deceived about the Pentagon as the CIT and PFT websites are very persuasive. The case against them has been building up gradually. Two substantial figures, Richard Gage and Peter Dale Scott, have come across. I note that DRG gave no support to CIT in his latest book and suspect that he is considering coming across. Every time a supporter of 9/11 Truth in general indicates that they support no-plane-at-the-Pentagon, we have an opportunity to enter debate with them. We just have to keep at it. Of course there will never be zero no-planers but we can make them feel lonely. Frank Legge on Sat, 01/21/2012 - 10:17pm.